Shanghi Slim Benefit Ball was a Success! Last Saturday night was witness to the power of music and friends and how the two intertwine. 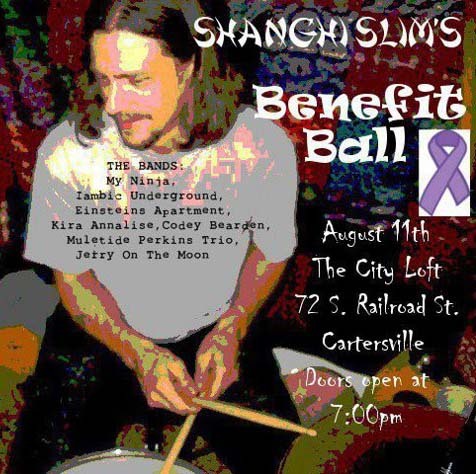 When Jim Maddux (aka Shanghi Slim while drumming with My Ninja) was diagnosed with cancer, the blow was felt by a large circle of local musicians, friends, co-workers and pretty much everyone who knows Jim. It’s not uncommon to agree with someone that Jim is a great guy, and the turnout at The City Loft in Cartersville proved that there are quite a few of others who agree. Jim’s Ninja posse (Phil Orton, Johnny Peyton, Paul Rowell) and other friends organized a concert fundraiser to help pay for some of those blasted medical bills that comes along with cancer. Jerry on the Moon, Kira Annalise, Muletide Perkins Trio, Cody Bearden, My Ninja, Iambic Underground, and Einstein’s Apartment provided a night of fresh and diverse music and a great time was had by all. However, the bills keep piling for Jim. If you weren’t able to make it to the show and would like to make a contribution, you can make a donation on the My Ninja store. Posted in Uncategorized | Comments Off on Shanghi Slim Benefit Ball was a Success! You are currently browsing the The Rumpus Compendium blog archives for August, 2012. Talking Jayhawk Music & Arts Festival! A visit with Liz Womble! A visit with Woody Earwood! A visit with JR from Bigfoot Music & Outdoors!